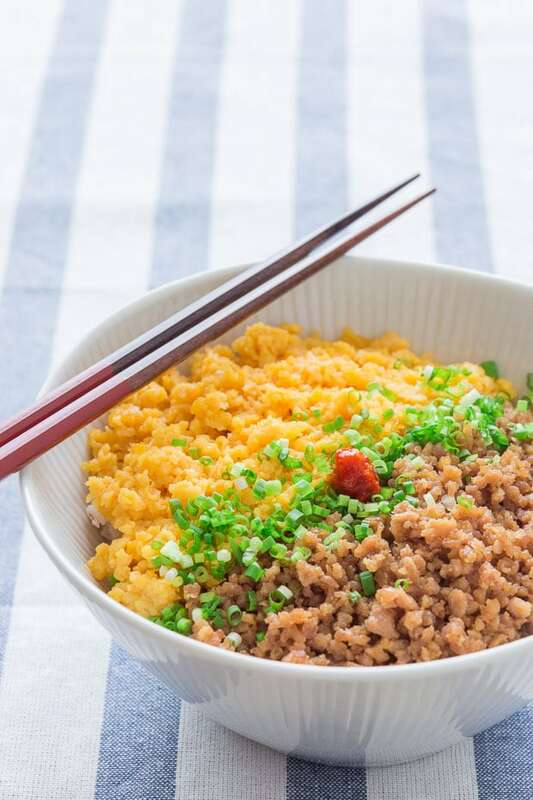 Soboro Don (そぼろ丼) is a simple Japanese rice bowl with sweet and savory ground chicken and some seasoned scrambled egg. It comes together in minutes making it a perfect weeknight meal, or an easy bento lunch to go. Like most things in life, the rules of cooking aren’t set in stone, and there are always exceptions. I’ve never been a big fan of certainties, and so for this Soboro Don (そぼろ丼) I’m going to tell you do break the rules and do something unthinkable for a classically trained chef. 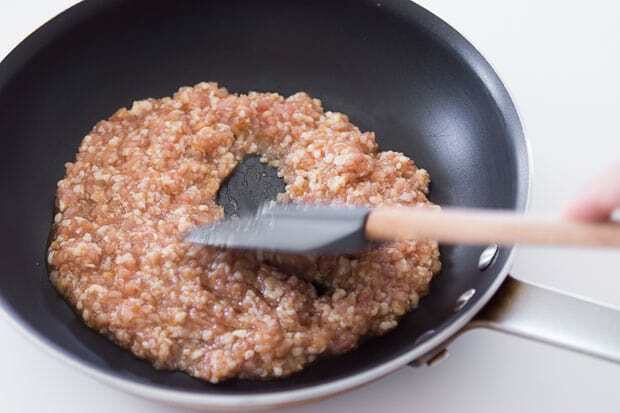 In most cases, common wisdom dictates that we brown ground meat first. This high heat method of cooking, caramelizes the juices coming out of the meat, increasing the depth of flavor thanks to the Maillard reaction. 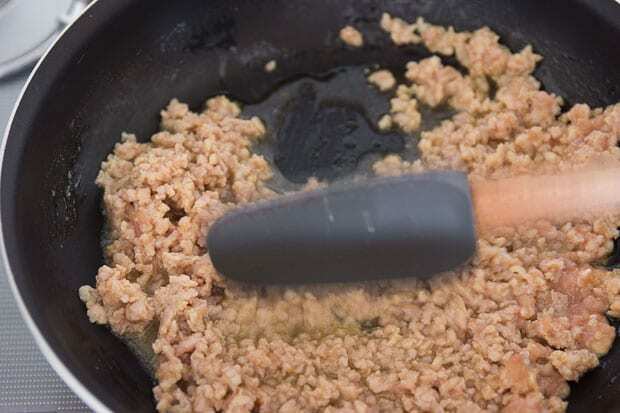 The problem with this cooking method when making soboro is that the high temperature sets the proteins in the meat too quickly and you end up with lumps of meat, instead of uniform crumbs. My solution is to use a lot of liquid in the chicken marinade, which helps to break up the meat before applying heat. 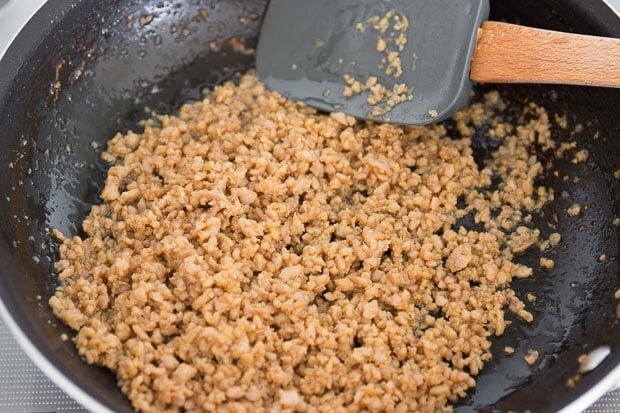 Then I cook the ground chicken slowly while chopping at the chunks with a spatula. This gives you plenty of time to break up the lumps, giving you beautifully uniform crumbs of chicken. “But what about the flavor?” you ask? Patience, young grasshopper… We still brown the meat, but we do it after the meat is cooked. Once the liquid the meat has been simmering in evaporates, we’re able to fry the chicken in the fat it releases, thus caramelizing the sauce around each morsel of chicken. For the egg, we also need to break a rule. I’ve said before that when making scrambled eggs, you shouldn’t stir them too vigorously to allow the formation of large fluffy curds. In this case, we don’t want large curds, and so you need to use chopsticks or a whisk to scramble the heck out of the eggs as they cook. With five ingredients and taking less than ten minutes to prepare, this Japanese chicken rice bowl may not seem like much, but one bite and I promise you’ll be hooked for life! Savory and sweet with a hint of ginger, the even grains of chicken taste like granules of concentrated chicken teriyaki. One one side of the bowl, you have intensely flavorful chicken with a firm crumbly texture, and on the other side, mild creamy curds of tender egg, which provides a marvelous juxtaposition of flavors, textures and colors. But perhaps the best part of this dish is that it’s just as good at room temperature, which is probably why soboro is one of the most popular items to put over rice in a bento lunch box. Add the sake, soy sauce sugar and grated ginger to a frying pan and whisk to combine. Add the chicken and use a spatula to break up the chicken and mix with the marinade. The chicken should have the consistency of loose oatmeal. Let this marinate while you prepare the eggs. 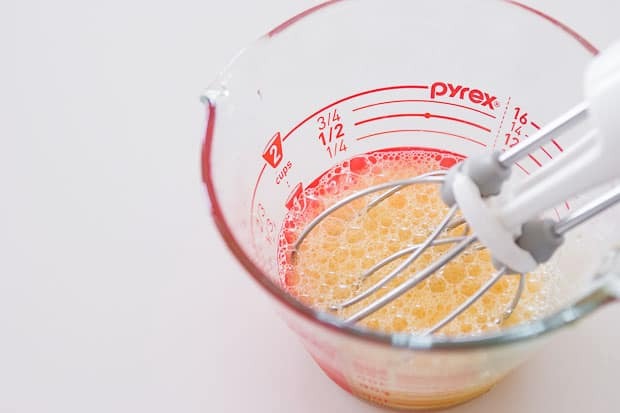 For the eggs: Beat the eggs, salt and sugar together until it is a uniform color. For the chicken: Put the chicken on the stove over low heat and slowly cook while breaking up any chunks that form with a spatula. As the chicken cooks, a lot of liquid will come out and at one point it will look almost soupy. This is fine. Once the chicken is cooked through turn up the heat to high and boil off all the liquid. Once the liquid has evaporated, the chicken should start frying in its own fat. If your chicken was very lean you may need to add a teaspoon of oil. Let the chicken fry until the chicken browns and the sauce has caramelized. When the chicken is done, pour the eggs into a non-stick pan and then turn the stove on to medium low. 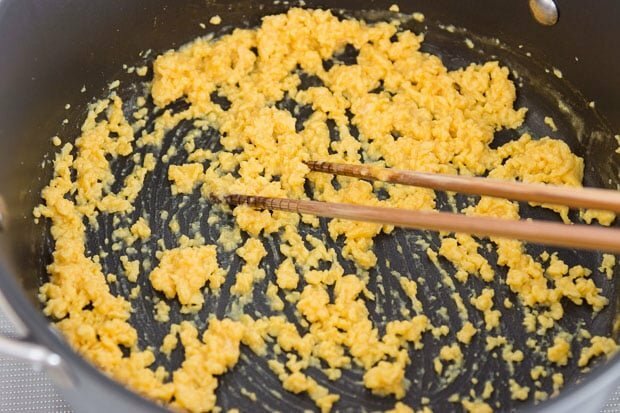 Once the eggs starts to set in the middle, use a whisk or chopsticks to vigorously scramble the eggs to make small grains of egg about the size of the chicken. To assemble: Cover half the rice with the egg and the other half with the chicken. Garnish with scallions and serve with your favorite hot sauce. Just figured I'd thank you (a year late). Just made this tonight and added a little gochujang and some dashi/soy stock to the sauce. Fantastic! I came across this blog googling recipes for this dish, and I have been reading it for the past 3 hours. Definitely going to try this and many of your recipes at home. Very nice blog!! If you’re using Japanese soy sauce it’s the dark kind. If you’re using Chinese soy sauce it’s the light kind. It should be dark in color, but not thick or sweet. Hi Larry, most butchers (even in grocery stores) will let you buy whole pieces of chicken and if you ask them to they’ll grind it for you. I guess you still have to worry about the cleanliness of their equipment, but at least you know what’s going into the grind. That said, this should be delicious with pork too. Just make sure it isn’t too fatty or you may need need to drain some fat off as it fries. I’m not going to be very eloquent here but will simply say, yum! Well, my nephew clarifies by saying, “Yummers!” This recipe is so versatile! Hi, Marc; Is there any cooking oil used in frying the eggs? Pls advise. Nope, that’s why you need to do it in a non-stick pan. Hi EL, I’m glad to hear you enjoyed it! Cooking wines tend to have salt added, so you may have noticed the soboro ended up a little salty. With or without sake? i currently don’t have sake or cooking wine in my kitchen, if i use water, will there be a big effect on the flavor of the dish? Thanks! oh by the way, could you please recommend any other replacement for sake? will soju be fine with the recipe? Hi John, Soju is distilled and the process removes a lot of the flavor. While it will probably work better than water, it’s not a great substitute. Hi Mark, this is a keeper! I paired it with homemade miso soup (of course from your dashi recipe). My 8-yr old daughter loved it. It’s so easy to prepare on a busy week night. The sake certainly adds umami to this dish. Thank you very much for sharing your recipes. Hi Geraldine, I’m so glad to hear your family enjoyed this dish! Could I use Miso instead? Hi Mike, that’s a great idea, just make sure the miso is fully dissolved into the chicken mixture as it tends to clump. Also, depending on how salty (or not salty) your miso is you may need to add more or less than the soy sauce. Hi Steve, so glad to hear your family enjoyed this! Wow, it looks oishī (delicious)! Can’t wait to try this dish. We love your blog and recipes. Are you interested in becoming Chicory’s official recipe partner? Thanks! I checked out your website but I really don’t want to add any more plugins to my site as each one I add makes it load slower. Hi Matsumoto, this is a common concern for our bloggers before cooperating with us. Our plugin is super light and doesn’t affect loading speed at all, and none of our partners have had any complaints about it slowing down their site (check our Roti n Rice’s blog!). Are you interested in giving us a try? Would this work with wine instead of sake? Or maybe vermouth? Hi Sammael, you could, but it will dramatically alter the flavor of the dish. If you want to substitute something without changing the taste, the best bet would be water. I can’t have access to sake (I’m a minor), but I do have cooking sake and hon mirin. Will one of these be a good substitute? Hi Bigpoppa, cooking sake usually has a ton of salt, and none of the flavor of sake, so I would not recommend using it. Mirin is too sweet, plus Hon-mirin is not real mirin (it’s made with alcohol and corn syrup). If you use the hon-miring, omit the sugar. Otherwise water will work fine. What kind of rice do you recommend serving this over? Japanese short grain rice (also sometimes labelled “sushi rice”) would be the usual rice, but you could use any kind of rice. Loved the flavors so much! Cooking it again for dinner.